It's pretty rare that a sports fan will get excited over something that isn't an actual match, but the draw of the World Cup is something that only comes around once every four years and produces drama at the highest level. A nation's perceived chances of winning the tournament may be boosted or destroyed over six months before the competition gets underway, simply through the act of a former World Cup star selecting the right (or wrong) ball from the pot. The draw in Moscow certainly broke a few hearts, although the overall feeling is one of optimism ahead of a tournament that will encapsulate the world. Hosts Russia will kick off the tournament with a match against Saudi Arabia on June 14, before moving on to face Egypt and Uruguay in a group where progression is certainly not out of the question. There are intriguing match-ups in all eight groups, and it has to be said that a 'group of death' doesn't really exist. Most nations have a genuine chance of making it to the second round, while matches like Spain vs Portugal and England vs Belgium will give us a glimpse of what to expect from the latter stages of the tournament. 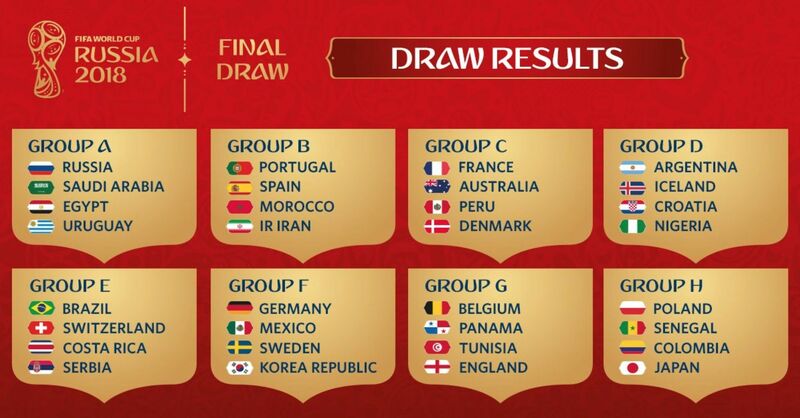 So who are the big winners and losers from the 2018 World Cup draw? The best way to answer this is to take a look at the outright tournament winner odds, both before and after the draw had taken place. Below are the two graphics, followed by our analysis. The big winners in the 2018 World Cup draw are the world champions, and their movement in the market is testament to that. Although few teams in the world should trouble the Germans, their path to the latter stages of the tournament is one of the easiest out of all the group winners. They will face fellow Europeans Sweden, CONCACAF top seed Mexico and South Korea in Group F.
Should they win the group as expected, their round of 16 clash will be against a team from Group E, containing Brazil, Switzerland, Costa Rica and Serbia. As the Brazilians are likely winners of that group, it will most likely be one of the other three teams, and none of them should trouble the Germans. Expect nothing short of a semi-final appearance from Joachim Low's side. Spain would have been nervous heading into the draw knowing that they could potentially fall into a group containing Brazil, Germany, France or Argentina, but instead they were placed alongside Portugal, before drawing favourable opponents in Morocco and Iran. As part of Group B, they will also progress to play one of the teams that advance from Russia's group, which is a big win for them. The hosts avoided the likes of Spain and England from Pot 2, and while they will still face a stern test in Uruguay, they should still see themselves as favourite to progress from Group A as they face Saudi Arabia and Egypt. A win in the opening match of the tournament against the Saudis is key to them progressing to the second round, and while they will likely come up against Spain or Portugal, anything can happen in the knockout stages. Columbia are a good side and it is was surprising to see them at such long odds to win the tournament before the draw took place. Just like the Russians, they have firmed thanks to a generous group, although we believe that this is possibly the best result of the lot and could set up a tournament to remember for the South Americans. Columbia have been drawn against Poland, perhaps the second-weakest pot 1 team after hosts Russia, and will also play pool matches against Japan and Senegal, who should not trouble them. Progression is practically assured, and they will likely move on to face England or Belgium, who compared to the likes of Brazil, Germany, Spain and France are definitely manageable opponents. Keep an eye on the Columbians at this World Cup. Poland appear alongside Columbia in Group H and they too will be delighted to have avoided some of the better teams from the lower pots. They too are at extremely long odds considering they were emphatic throughout qualifying, although their ranking of sixth in the world exposes a flaw in the FIFA rankings system that relies too much on friendly results. Nonetheless, they are almost certain to make it to the second round and will cause England or Belgium some problems. Based on the draw, Group H opponents Japan and Senegal have also firmed, although we do not rate their chances of progressing ahead of Poland and Columbia. 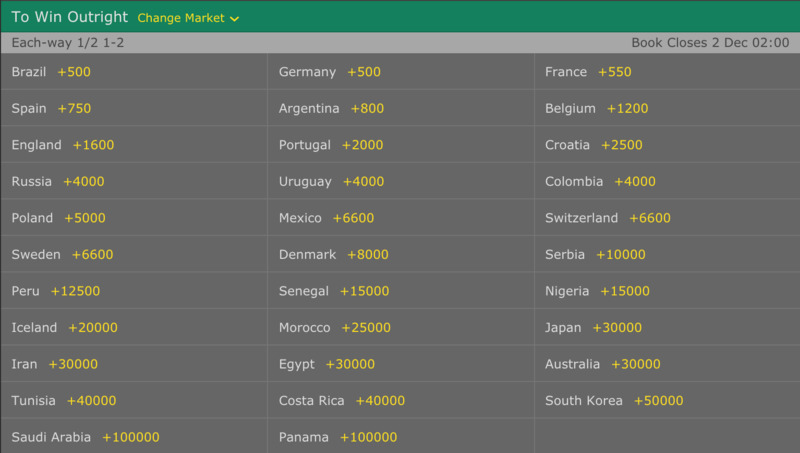 Japan have moved from +30000 to +25000, while Senegal's chances have increased at the same rate: +15000 to +12500. The biggest movers were the Egyptians who have seen their odds slashed in half after being drawn alongside Russia, Uruguay and Saudi Arabia. Egypt will certainly fancy their chances against Saudi Arabia, while their match against the hosts will be critical to their chances. Argentina are a great team, although their performance in the South American qualifiers was less than impressive and is the reason why they appear outside of the top four favourites to win the tournament. It's hard to understand why they're now at longer odds though - their group is perhaps a little more difficult than some of the others but they should still be favoured to progress. Lionel Messi and co. will be joined by two European nations in good form - Iceland and Croatia - plus a strong Nigerian side. Should they progress as expected, they will face one of France, Denmark, Peru and Australia in the second round. Portuguese hearts would have dropped when Spain was placed alongside them, although in truth that should be their only hurdle in a reasonably straightforward Group B fixture list against Morocco and Iran. They also will come up against a Group A opponent in the second round, so we're not too sure why the odds on the Portuguese team winning the tournament have dropped so dramatically. At +2500, the European champions are very good value, although this time they won't be able to finish third in their group and progress. We think they're a good chance of making it to the quarter-finals and from there, anything can happen. 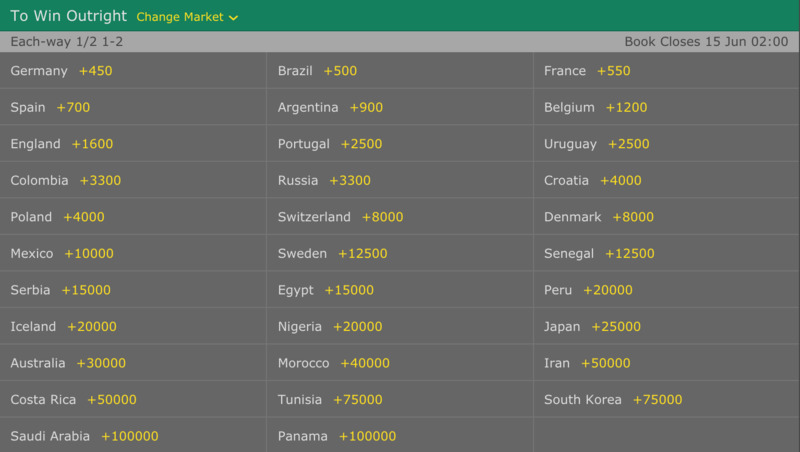 Despite their decent from in the qualification round and in their dominant playoff victory over Greece, the Croatians are seen as an outsider for the 2018 World Cup, and after drawing alongside Nigeria, Iceland and Argentina in Group D, it appears the bookies are giving them even less of a chance. We agree it is a tough group, however believe that they should still at least come second. The problem is that if that is the case, they will likely face France in the round of 16, which would surely end their campaign. Switzerland were drawn alongside Brazil in Group E and will likely battle it out with Serbia (down from +10000 to +15000) for a place in the second round. From there, they are a good chance of coming up against Germany and although defensively resolute, we don't fancy the chances of the Swiss team in 2018. Sweden and Mexico also fell considerably after being grouped with the Germans in group F. Their plight is similar to that of Switzerland - battle for second in the group and prepare for a likely match against Brazil. Sweden was the biggest mover, falling from +6600 to +12500, while the Mexicans blew out from +6600 to +10000. The majority of teams not expected to progress past the group stages have seen their odds drop, although this presents an opportunity for punters looking for a value pick. The above odds are guaranteed to fluctuate over the next six months as form and fitness dictate. The next international break is not until March, so we won't see any of the teams in action until then, so all eyes will be on the world's top domestic leagues to watch the progress of the top players. We will continue to provide updates as they come to light, and will have an in-depth analysis of every team and each group in the lead up to Russia. Stay tuned for more! *Daily schedule, all times GMT. Thursday, June 14: Russia vs. Saudi Arabia (Group A), Moscow (Luzhniki) 4 p.m.
Friday, June 15: Egypt vs. Uruguay (A) Ekaterinburg 1 p.m.; Morocco vs. Iran (B) St Petersburg 4 p.m.; Portugal vs. Spain (B) Sochi 7 p.m.
Saturday, June 16: France vs. Australia (C) Kazan 11 a.m.; Argentina vs. Iceland (D) Moscow (Spartak) 2 p.m.; Peru vs. Denmark (C) Saransk 5 p.m.; Croatia vs. Nigeria (D) Kaliningrad 8 p.m.
Sunday, June 17: Costa Rica vs. Serbia (E) Samara 1 p.m.; Germany vs. Mexico (F) Moscow (Luzhniki) 4 p.m.; Brazil vs. Switzerland (E) Rostov-on-Don 7 p.m.
Monday, June 18: Sweden vs. South Korea (F) Nizhny Novgorod 1 p.m.; Belgium vs. Panama (G) Sochi 4 p.m.; Tunisia vs. England (G) Volgograd 7 p.m.
Tuesday, June 19: Poland vs. Senegal (H) Moscow (Spartak) 1 p.m.; Colombia vs. Japan (H) Saransk 4 p.m.; Russia vs. Egypt (A) St Petersburg 7 p.m.
Wednesday, June 20: Portugal vs. Morocco (B) Moscow (Luzhniki) 1 p.m.; Uruguay vs. Saudi Arabia (A) Rostov-on-Don 4 p.m.; Iran vs. Spain (B) Kazan 7 p.m.
Thursday, June 21: France vs. Peru (C) Ekaterinburg 1 p.m.; Denmark vs. Australia (C) Samara 4 p.m.; Argentina vs. Croatia (D) Nizhny Novgorod 7 p.m.
Friday, June 22: Brazil vs. Costa Rica (E) St Petersburg 1 p.m.; Nigeria vs. Iceland (D) Volgograd 4 p.m.; Serbia vs. Switzerland (E) Kaliningrad 7 p.m.
Saturday, June 23: Belgium vs. Tunisia (G) Moscow (Spartak) 1 p.m.; Germany vs. Sweden (F) Sochi 4 p.m.; South Korea vs. Mexico (F) Rostov-on-Don 7 p.m.
Sunday, June 24: England vs. Panama (G) Nizhny Novgorod 1 p.m.; Japan vs. Senegal (H) Ekaterinburg 4 p.m.; Poland vs. Colombia (H) Kazan 7 p.m.
Monday, June 25: Uruguay vs. Russia (A) Samara 3 p.m.; Saudi Arabia vs. Egypt (A) Volgograd 3 p.m.; Spain vs. Morocco (B) Kaliningrad 7 p.m.; Iran vs. Portugal (B) Saransk 7 p.m.
Tuesday, June 26: Denmark vs. France (C) Moscow (Luzhniki) 3 p.m.; Australia vs. Peru (C) Sochi 3 p.m.; Nigeria vs. Argentina (D) St Petersburg 7 p.m.; Iceland vs. Croatia (D) Rostov-on-Don 7 p.m.
Wednesday, June 27: South Korea vs. Germany (F) Kazan 3 p.m.; Mexico vs. Sweden (F) Ekaterinburg 3 p.m.; Serbia vs. Brazil (E) Moscow (Spartak) 7 p.m.; Switzerland vs. Costa Rica (E) Nizhny Novgorod 7 p.m.
Thursday, June 28: Japan vs. Poland (H) Volgograd 3 p.m.; Senegal vs. Colombia (H) Samara 3 p.m.; England vs. Belgium (G) Kaliningrad 7 p.m.; Panama vs. Tunisia (G) Saransk 7 p.m.